Once again we had a wonderful time of fellowship and thanksgiving at our Supporters’ Dinner last month. The reports from the various ministries were so inspiring and a true testimony that God is at work: in New Zealand, in the Pacific, and worldwide. Without your support that could never have happened. When you did your EE training, you were given a booklet called Partners in Praying. Have you looked at it lately? One of the key verses come from Ex 17:9-13, where Aaron and Hur helped to keep Moses’s hands up. They were his support troops. You are our support troop and without your prayers EE would be totally ineffective. Our team is gradually growing and we are very excited about a Visioning Day we have planned on 5 July when we will discuss how God wants us to grow and what we need to change. We are also working on improving our avenues of communication (making them more 21st century). Thank you for holding our hands high. Thank you for rejoicing with us. May we continue to build each other up and encourage one another. We recently completed the XEE implementation workshop at Remuera Chinese Methodist Church and during the on-the-job training, an Iranian Muslim man, who heard the gospel for the very first time, said “I have never heard anything like this before, thanks for sharing with me”. The seed was planted in his heart and he has agreed to a weekly bible study to learn more about Jesus. Praise the Lord! I also shared the gospel with a young waitress who was suffering from depression and was suicidal. She accepted Christ and felt immediately the depression leave her. The power of God was evident as she was filled in the Spirit. I am now discipling her to grow in Christ. We have also completed the Share Your Faith workshop in Massey Presbyterian church, which went really well. Thank you for all your prayers. We will now go on and complete the seven weeks EV2 with couple of trainees. May was a very full month, beginning as it did with the Supporters’ Dinner. How good it was to meet up again with ‘EEians’ from right across the spectrum and be encouraged and challenged about seeing mission local and international as being one. Shortly after, I was off to Arden Woods, North Carolina, USA, for our first in person Vice-President’s Conference and meeting with the EE International Board. It wasn’t nearly as scary as I expected! It was so good working together and feeling free to express one’s views and insight. I couldn’t help thinking how amazing it is that each VP represents a different continent of the world but we are one in Christ and He is building us into a team. A sadness during the week was the passing of Anne Kennedy, wife of Dr. James Kennedy, Founder and First President of EE. She was one of his first trainees and thereafter, to the age of 91, she made it her aim to share the Gospel with someone every week. She wrote the names of every person she led to Christ in a notebook, filling many of them in her lifetime. Imagine the welcome she will have into heaven. The end of May found me in Fiji, where I was seeking to help the Board better understand its role in directing the ministry and in supporting the National Director. In the coming months I’m planning similar trips to the other nations. May God bless you in your mission, Anne Bowie. On 6 and 13 May, Lewis Bacon and I had the privilege of teaching a group of passionate and enthusiastic Filipino ladies at an Hope for Kids Training Workshop at Birkenhead Baptist Church, including participants from Word International Ministries NZ, and were a joy to work with. For on-the-job training Lewis went back to Auckland the following weekend for a successful morning session putting into action parts of the program they had learnt. Since then Lewis has suffered a major health setback. On Saturday 27th of May he had an angioplasty procedure and two stents inserted into blocked arteries. He is now recovering and is needing to take a few weeks off from his ministry work. Please uphold Lewis and pray that our Heavenly Father will minister and bring healing to his body and that there will be no long term negative effects to his health. Eternal life is a free gift. The Bible says, “eternal life in Christ Jesus our Lord.” And because heaven is a gift, like any other genuine gift, it is not earned or deserved. No amount of personal effort, good works or religious deeds can earn a place in heaven for you. “For it is by grace you have been saved, through faith, and this is not from yourselves, it is a gift of God, not by works, so that no-one can boast. Why is it that no-one can earn his way into heaven? Because man is a sinner. “for all have sinned and fallen short of the glory of God.” Sin includes much more than murder or robbery. In fact, it is anything we think, say, do or don’t do that does not please God. And because of this, man cannot save himself. If you want to save yourself by good deeds, do you know how good you would have to be? “Be perfect, even as your heavenly Father is perfect.” With such a high standard, no-one can save himself. However, in spite of our sin, God is merciful and doesn’t want to punish us. The Bible says that “God is love.” And He says “I have loved you with an everlasting love.” But the same Bible which tells us that God loves us also tells us that God is just and therefore must punish our sins. The Bible says “Yet He does not leave the guilty unpunished. The souls who sins is the one who will die.” We have a problem, God loves us and doesn’t want to punish us, but He is just and must punish sin. This gift is received by faith. Faith is the key that opens the door to heaven. Many people mistake two things for saving faith; One, saving faith is not just head knowledge about God. Two, saving faith is not just turning to God for temporary needs. Saving faith is trusting in Jesus Christ alone for our eternal life both now and forever. This means trusting in what He has done, rather than in what we have done. “Believe in the Lord Jesus and you will be saved.” You have just heard the greatest story ever told about the greatest offer ever made by the greatest Person Who ever lived, Jesus Christ. The question that God is asking now is; would you like to receive the gift of eternal life? Because this is such an important matter, let’s clarify just what it involves. It means that you need to transfer your trust from what you have been doing to what Christ has done for you on the cross. Accept the living Christ as Saviour, open the door to your heart and invite Him in. He says “Here I am, I stand at the door and knock. If anyone hears my voice and opens the door, I will come in.” Receive Jesus Christ as Lord. Give Him the driver’s seat and controls of your life, not the back seat. Repent of your sin, be willing to turn from anything that is not pleasing to Him. He will reveal His will to you as you grow in your relationship with Him. Now, if this is what you really want, you can go to God in prayer. right where you are. You can receive His gift of eternal life through Jesus Christ right now. “For it is with your heart that you believe and are justified, and it is with your mouth that you confess and are saved. “Everyone who calls on the Name of the Lord will be saved. If you want to receive the gift of eternal life through Jesus Christ, then call on Him, asking Him for His gift right now. Here is a suggested prayer; Lord Jesus, thank you for Your gift of eternal life. I know I am a sinner and I do not deserve eternal life, but You loved me so, You died and rose from the grave to purchase a place in heaven for me. I now trust You alone for eternal life and repent of my sin. Please take control of my life. Thank You so much. If this prayer is the sincere desire of your heart, look at what Jesus promises to those who believe in Him; “I say unto you, he that believes in Me has everlasting life.” Welcome to God’s family! 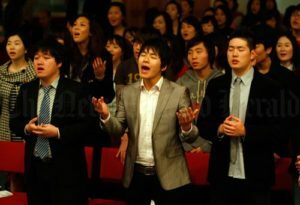 Hanouri Korean Presbyterian Church on Auckland’s North Shore, which has 1,500 congregational members, is currently working with Evangelism Explosion Ministries in Auckland to equip its members with the EE gospel sharing technique. We begin with Share Your Faith workshop, followed by seven weeks of EV2 (Everyday Evangelism) to equip six pastors from the main pastoral team, who will then go on and implement a training program for their members, which will result in multiplication and expansion of God’s workers and the gospel preached to the Korean community. We are so excited to share this news. God is at work among the Korean community.